Larryta Express has been around for a couple of years now, but have never really taken off with foreigners because — seriously — their logo is hard to read. I’ve actually had someone ask me if I’ve taken the “squiggly van” before. The answer is yes! I took a Larryta Express mini-bus from Phnom Penh to Siem Reap last week and have the full report. It’s not just a squiggle, it’s Larryta Express! Larryta Express have a fleet of new vans, and have more daily departures than any other company I know about, going from Phnom Penh to Siem Reap nine times a day, and the same from Siem Reap to Phnom Penh. Because they have so many departures, it’s easy to get a ticket even on the same day. My bus was scheduled to leave at 11 a.m. and ended up arriving in Siem Reap at 4:50 p.m. The mini-bus left 15 minutes late from Phnom Penh, apparently to wait for a new passenger and try and sell a few extra seats, which was annoying. The total drive time was about 5.5 hours; the Larryta driver was driving fast, but not terrifyingly so, and didn’t make any overtly unsafe passes or stops. Right now the road is very smooth, so it’s easier for drivers to drive safely and make it in a reasonable amount of time. The inside of one of the Larryta Phnom Penh to Siem Reap mini-buses. 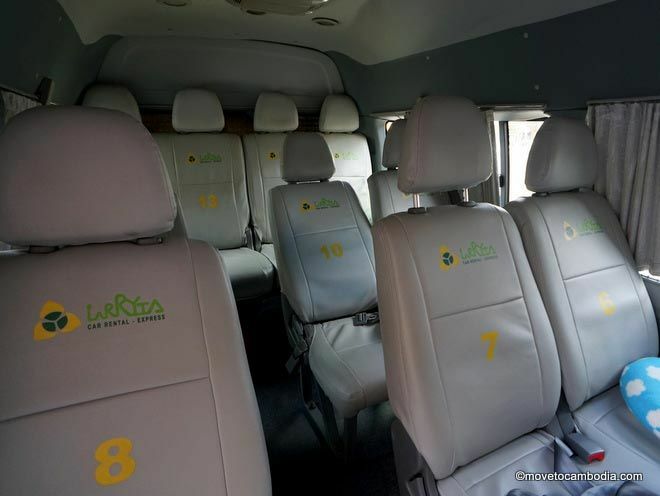 Larryta Express uses Ford Transit Vans, which seat 15 passengers. The buses are relatively new and have seatbelts. Seats 1 and 2 are up front with the driver (2 is the window seat). The second row has three seats, 3, 4, and 5. The third row has a pair of seats, 6 and 7, that are good if there are two of you, and a solo seat, 8, that has good legroom if they don’t decide to put extra luggage there. The fourth row is another pair of seats, 9 and 10, and one more solo seat, 11. The back row, 12, 13, 14, 15 is crowded, but not as unpleasant as other companies because it’s slightly elevated. We stopped twice along the way. The first stop was outside of Skun at one of the typical bus stops that has an outside restaurant offering a buffet of Cambodian dishes. I got a plate of a pork stir-fry with rice and a bottle of water for 6,000 riel ($1.50), which seemed like a good deal because the bus stop restaurants are notoriously overpriced. The second stop was at the much maligned (by me) Arunas Hotel in Kampong Thom, who are known for doubling their menu prices for foreigners. Use their toilet, but you can find a more reasonably priced meal to the left and across the street (if you’re facing Arunas) at a casual place that offers just about every popular Cambodian dish. 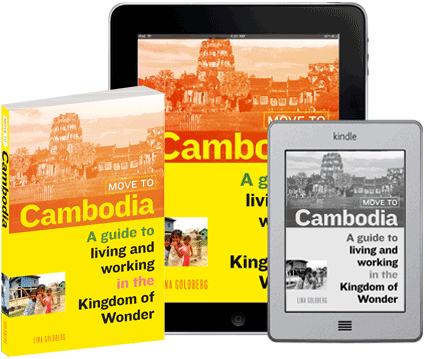 Once you arrive in Siem Reap, be aware that the Larryta office is not in the center of town and you will need to take a tuk tuk from there. The drivers that congregate at the office ask extortionate prices, you should not pay more than $3 for a ride into town. Either negotiate in advance or walk a bit away from the office and flag down a passing tuk tuk to get a better price. The Larryta Express station in Siem Reap — the best place to find an overpriced tuk tuk. Tickets cost $8 for Cambodians and $10 for foreigners. 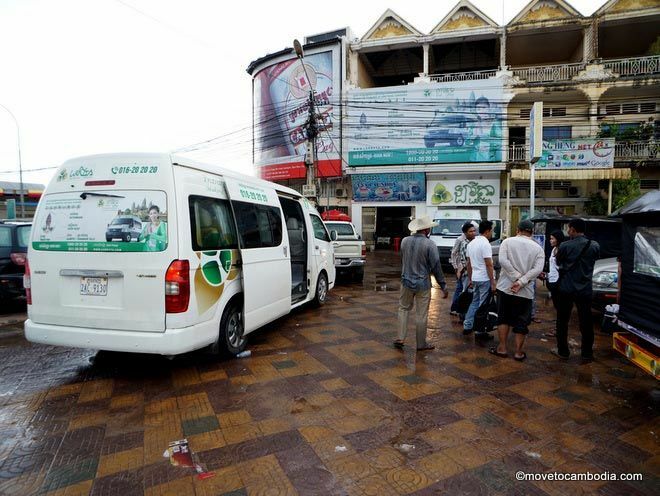 As always, I find dual pricing abhorrent, and try to avoid companies that use it (Cambodia Post VIP Van and Giant Ibis have the same prices for everyone). I have heard reports that if you can get them to issue you a local ticket, they will honor it, but I haven’t dared to do it myself. If you’ve tried, please let me know how it goes. Tickets can be purchased online at BookMeBus for a small fee of around $1 or less, and you can make a seat request at the time of booking. If you don’t request a specific seat, they will get the seat closest to the front for you, and if you’re traveling solo, they’ll get a solo seat if it’s available. Tickets can also be purchased at the Larryta office or at travel agents in Phnom Penh and Siem Reap. 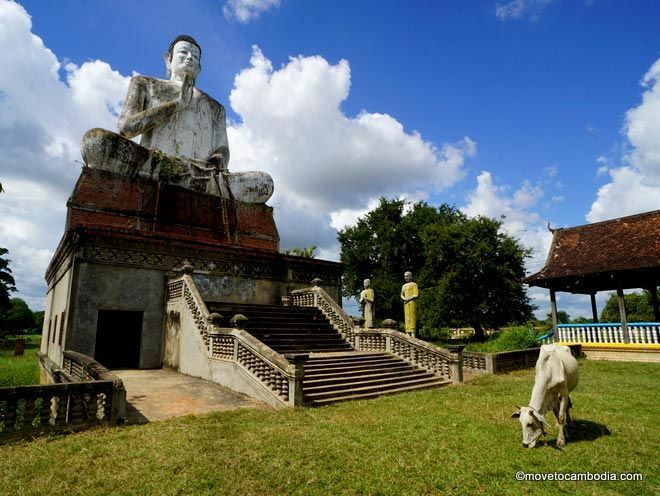 In addition to the Phnom Penh to Siem Reap route, Larryta Express also goes between Phnom Penh and Sihanoukville. Buses run from Phnom Penh to Siem Reap at: 7 a.m., 8 a.m., 9 a.m., 10 a.m., 11 a.m., 1:30 p.m., 2:30 p.m., 3:30 p.m., 4:30 p.m. Buses run from Siem Reap to Phnom Penh at: 7 a.m., 8 a.m., 9 a.m., 10 a.m., 11 a.m., 1:30 p.m., 2:30 p.m., 3:30 p.m., 4:30 p.m. 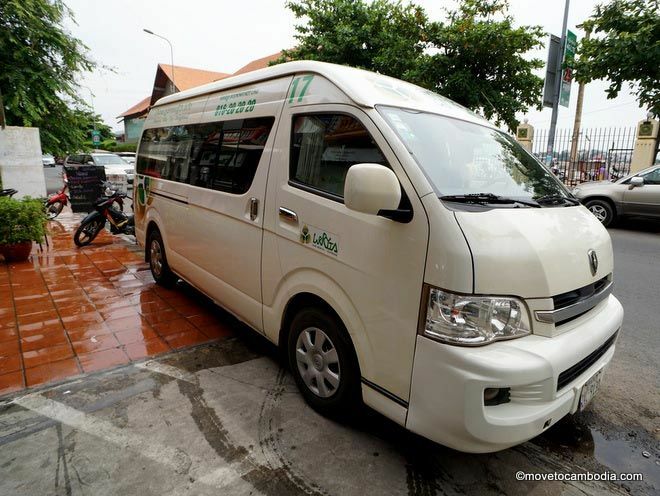 This entry was posted in Transportation, Phnom Penh, Siem Reap and tagged Phnom Penh to Siem Reap, Siem Reap to Phnom Penh, Phnom Penh Siem Reap mini-buses, Cambodia mini-buses, Larryta Express. Bookmark the permalink.